Scripture descends to speak to us, using metaphor to reveal the holy. Despite knowing that God is incorporeal, we pray, “Blessed are You,” which assumes that God has ears. Our desire for closeness to God, however, may override the disquieting question of who we are talking to and who is listening. For those who find physical descriptions of God inadequate, the natural world may prove more helpful. We may imagine God as hatzur (“the Rock”), a solid, majestic natural object, or we may peek at the Mind that repeats a pleasing symmetry throughout nature in the sacred geometry of a leaf. Even more intimately, when Torah uses the human body as a code to decipher God, we glimpse through ourselves the presence of our third Parent, in whose image we are created. Parashat Eikev hints at the luminous potentiality of our bodies to experience God. The portion begins, “And if (eikev) you do obey these rules and observe them carefully, YHWH your God will maintain faithfully for you the covenant that God made” (Deuteronomy 12:12). Why is the term eikev (here translated as “if”) used and not more common words for introducing a conditional clause (such as ‘im or ki)? The language in our parashah invites the commentator Rashi to make a pun, linking the word eikev to the noun akeiv, meaning “heel.” Rashi writes that if we heed even minor commandments that are easy to trample over with our heels (i.e., commandments that we are likely to treat lightly), then God will keep the promises given to our ancestors. Read in this manner, the portion opens with a warning about not allowing thick skin to divert us from the path we walk towards God. Like Moses who takes off his shoes to experience holiness emanating from the earth, so we too are called to remove all barriers between God and ourselves. The next verse states, “[God] will favor you and bless you and multiply you–blessing the issue of your womb” (7:13). What is interesting here is that the grammar in the Hebrew is all masculine singular. Are men imagined as having wombs, or more darkly, as owning women’s wombs? Perhaps we can generously understand the verse as a suggestion that empathy can allow anyone to feel the blessing of a full womb. We know God first as the Creator, the womb of the world. The organ that nurtures potential life may only be found in half the population, yet Torah suggests that both men and women celebrate pregnancy and birth. If we accept this idea, then women can look at a later verse in our parashah that speaks in an unequivocal male metaphor and not feel excluded. Although our translation reads, “Cut awayÉthe thickening about your hearts” (10:16), a more literal translation of this verse is, “CircumciseÉthe foreskin of your heart.” In other words, remove that which obstructs your heart and keeps you from following GodÕs teachings; open yourself up to experiencing “the great, the mighty, and the awesome God” (10:17). The foreskin in this expression can be likened to the thick skin on our feet that keeps us from feeling our connection to the Holy most intimately. Women and men alike can have a heart that is tender, loving, and open to the Divine, not just those who have literally been circumcised. The metaphor that calls for a naked heart may help us to understand a deeper reason for the mysterious and frankly disturbing ritual of brit milah (circumcision). Native American and Mayan beliefs align with Kabbalah in understanding the left side of the body as feminine and the right as masculine. Since the heart rests on the left side, circumcising the heart brings feminine energies into play. Would the addition of a circumcised heart bring into a balance the masculine and feminine energies? Perhaps the metaphor found in parasht Eikev hints that the ritual’s purpose is to remind both men and women to keep the heart tender, for this is not only a woman’s quality. The circumcised heart is not gender specific. All of us are called to bring forth creative and nurturing energy within ourselves, and to act with an empathic heart. Some say that the reason that girls do not have an equivalent physical ritual to brit milah is that they are born circumcised, the implication being that they are born with unveiled hearts. Brit milah, then, becomes a spiritual catch up for boys to approach the openhearted potential of girls. Being a mother of sons, I have trouble with this explanation, yet we know that women walk through the world with circumcised hearts by their very place in almost all cultures. They reveal themselves because they often have little power and therefore less to lose. When we think of the hardened, calloused heel that feels little under it, experience shows that women do not have the luxury of stepping without looking very carefully. Every misstep becomes a reason to keep us back; it becomes an accusation of our iniquity or incompetence. Rabbi David Mark sees the brit milah in a broadened mythic connection. He writes, “Anthropologically, the connection between the phallus and the ourobouros, the mystical snake rolling through eternity with its tail in its mouth, assures a similar fate for our Jewish people: by removing the foreskin from the phallus (as the snake, symbol of eternal life, sheds its skin), we incorporate God’s promise of eternal life for the Children of Israel directly into the male organ of reproduction.” Applied to parashat Eikev, this interpretation helps us to see that a circumcised heart, possible for all of us, allows for growth and expansion, and gives a model for sloughing off gratuitous, constraining defenses. 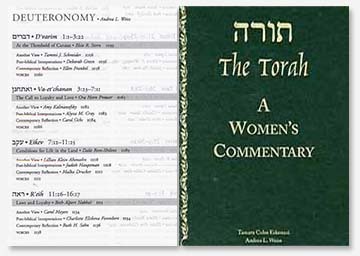 Torah gives us a language that speaks beyond the physical world and gender. Both women and men embody God in their ordinary lived experience. Just as we reach for another to lift us from danger or despair, so we understand God reaching for us with an outstretched arm to free us from slavery. In our male and female bodies we find God, and in this discovery we know ourselves to be more than physical beings. Whether we have wombs or foreskins, all of us are called to be creative and transparent before God.